The anti-ageing effects of antioxidant vitamin supplements were yesterday extolled by legendary film star and bon viveur, Count Dracula. The Romanian aristocrat turned actor and personality explained that without his tailored regime of antioxidants he would never be able to sustain his punishing round-the-clock lifestyle. 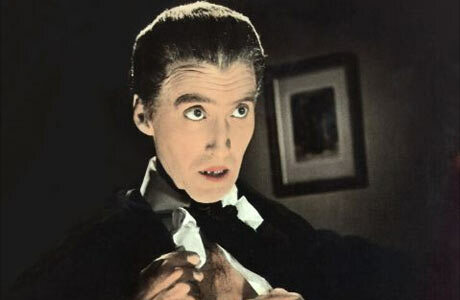 Count Dracula joins other celebrities, like Sir Cliff Richard, Gloria Hunniford, actress Jenny Seagrove and Carole Caplin, who have spoken out to defend supplements after recent medical studies suggested that antioxidant supplements did not benefit those taking them, and might even be harmful. “Of course that’s complete rubbish”, says the astoundingly youthful-looking Count emphatically. “I take vitamins A, B, C D, and E every day, as well as Beta-Carotene and N-acetylcysteine by the bottle-load, and I absolutely swear by them all”. Dracula’s supplement regime certainly seems to be working – he hardly looks a day over forty, though persistent rumours place his birthday somewhere in the 15th century. The star is understandably coy about his exact age, admitting only that he has “seen a few centuries come and go”. Dracula looks especially well for a man who admits that he had been laid up only a couple of days before with a bad stomach. “I must have eaten someone that disagreed with me” he quips. He thinks perhaps the meal that laid him low probably contained too many chemical food additives. Dracula also has a special dietary problem – his unusual diet is rich in iron and protein, but missing the fruit and vegetables that normally supply phytochemical (plant-derived) antioxidants. That, he says, is where the antioxidant supplements help. He is scornful of the recent science suggesting antioxidants don’t help people stay healthy. The Transylvanian-born star certainly seems ultra-healthy, not to mention in splendid form – “call me Vlad” he says, with that famous toothy grin. Our interview takes place at 4 am, but he looks as if he is just getting ready to go out for a night on the town. He does admit to being “an unapologetic 100% night person”. Given his nocturnal hours and hectic schedule, simply finding the time for a sit-down meal can be a problem. When he does succumb to the need for a snack, Dracula know what he likes. “I simply adore traditional black_pudding as a quick bite” he confides “but I can’t eat it too often. I worry about all the nitrate preservatives they put in it, you know”. This entry was posted on April 21, 2008 at 8:45 pm and is filed under Alternative medicine, bad science, Humour, Nutri-nonsense. You can follow any responses to this entry through the RSS 2.0 feed. You can leave a response, or trackback from your own site. Funny. What I’ve been wondering, in the last couple of days, is if all this muddying of the issue (referring to excluded trials etc) is done cynically in the knowledge that most people won’t be familiar with how meta-analyses such as the Cochrane reviews are conducted. Or can the industry representatives raising these objections themselves be ignorant of the methodology? I suspect the first, particularly given the recourse to the ‘argument from celebrity anecdote’. Whichever the case, it looks like there is an urgent job to be done regarding improving popular understanding of scientific evidence, particularly relating to health. About quackery courses in universities. http://www.guardian.co.uk/commentisfree/2008/apr/26/medicalresearch.health and on the Bad Science site. Excellent step towards improving popular understanding of how this meta-analysis was conducted. My only reservation is about preaching to the converted – what chances of getting something like this into, say, the Daily Mail or women’s magazines (my bete noir)? Or are they too dependent on advertising from supplement manufacturers etc? You never know with the Daily Mail, Claire – if they think that “the wind is changing” they quite probably will publish some stuff setting out the evidence on Alt Therapies – see for instance the two pieces they recently ran about Edzard Ernst’s and Simon Singh’s new book here and here, and which are apparently part of a series. Or at least, the Mail may start printing both science and non-science (nonsense? ), which in effect is what the Guardian does. Ben’s column is an oasis of scientific sense in the Guardian, but the “Life and Health” pages (womens’ pages as was) are still full of evidence-misquoting claptrap like this dismal article from yesterday. The womens’ magazines are something else again. If they can’t sell women the “you can stay young and attractive forever” myth, then what exactly do they have to sell? So don’t expect to see them signing up to reality any time soon. Count D, great to read your thoughts. I have always been a bit of a fan of yours. You do bear a passing resemblance to the the renowned British nutrition therapist Patrick Holford. Are you by any chance related to him? Always a delight to hear from a fan. I can’t really say if young Patrick has picked up a tip or two from me. .. though we do both seem to have a lot of devoted female fans. Patrick is a much more casual dresser than me, of course – I have never really been able to get used to denim and an open necked shirt. It will sound terribly old-fashioned, but I still think the mark of a real gentleman is a well-tailored formal suit. As to the diet, I’m afraid too much fibre tends to give me gas. My liquid diet isn’t for everyone, but I think it keeps me young. Along with the supplements, naturally. You’re right Dr Aust, the Daily Mail has been showing intriguing signs of rationality of late! With regard to women’s magazines, I wonder if it would have any effect if, say, female students/graduates in scientific disciplines were to monitor such publications and write – in numbers – to the editors of those promoting pseudoscience? You never know, treating your readers as if they might actually be intelligent could be good for circulation figures (and for my blood pressure! ).